By Bogna Haponiuk and Mateusz Mucha. 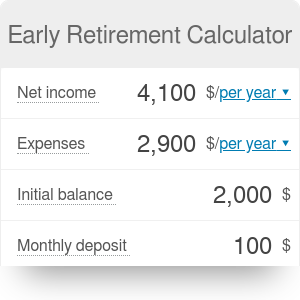 What is the early retirement calculator? How to minimize the time before retirement? How much longer do I have to save until I can live off my savings interest? Alternatively, you can use it to find out how much you need to earn in order to retire after a set amount of time has passed (just provide the "duration" and "expenses" fields). The model is very simple and elegant: we want to find out what amount will let us safely withdraw cash for our expenses. The idea comes from the famous Trinity Study, which concludes that 4% is the magic number - your investment is fairly safe from depleting too fast - it should last for at least 30 years. So we just need to find out a number of which four percent equals our monthly expenses. For the initial period (when we save money), we used Warren Buffet's claims about expected average Return on Investment (see below for more info). Why do we have different values for RoI and withdrawal rate? While their function is essentially the same (how much money your money makes each year), there's one important distinction: when you're in the saving stage (pre-retirement) and the market doesn't do very well, the worst that can happen is that you won't save as much or you'll lose a bit. You can still rely on your active income. When you do retire and quit actively early money, you need to extra save. So in this model, RoI is an expected gain and withdrawal rate is adjusted down for safety reasons. Both numbers take inflation into account - just imagine we have 0% inflation and $10 in the future is worth just as much as $10 now. In reality, your investment will yield a better return, but your cash will be worth less in the future. Both effects cancel each other out. Unlike other similar tools (such as our retirement calculator), this one assumes that you will live solely from the interest that accumulates each year on your account. Why is this difference so significant? Take a look at a regular retirement calculator. You have to input your life expectancy - in other words, the time of your decease. These calculators assume that you will drain all of your resources by that time, so if you happen to live longer than you "planned" to, you will be left penniless. Not really a great perspective, huh? In this early retirement calculator, we assume that you will save so much that you will achieve total financial independence. Each year, your expenses will be covered by the interest accumulating on your account. In other words, you will have a passive income as high as your expenses. The account balance will only increase, what means that you will your children will inherit your small fortune. Now that you know the application of the early retirement calculator, it's important that you know how to use it, too. Planning your financial future is easier than you'd think - just follow the steps listed below. Begin with determining your net income. It is the amount of money you make every year after all deductions (for example taxes). The next step is to determine your yearly expenses. Our early retirement calculator assumes that your lifestyle won't change significantly during your lifetime. It means that your expenses will be kept at the same level before and during your retirement. If you don't know your expenses level, this budget calculator might come in handy. Decide on your initial investment. How much money can you put into your savings account today? Remember that you won't be able to take it out before your retirement! Our calculator has this value set to $0 by default, but if you have some savings already, you can include them in your calculations. Our calculator will find the monthly deposit automatically. It is the amount of money you will be able to add to your savings account every month. Choose the return on investment. It is the percentage interest rate of your account. By default, it is set to 5%. We suggest to use this number as a representative, even if a little subjective, measure of your investments return. Where did this number come from? As suggested by Warren Buffett, one of the most successful investors in the world, total returns can be expected to reach 7% (it is also a historically correct number). After taking inflation of approximately 2% into account, we get 5% return on investment. You also have to decide on the withdrawal rate. This is the percentage of the sum accumulated on your account you will withdraw on an annual basis. We assume that is is equal to 4%, a bit less that the return on investment to cushion any kind of fluctuations on the market that may cause temporary decreases in your interest rate. After you decide on all of these values, the early retirement calculator will show you the required final balance of your account and the time you will need to achieve this goal. If you start saving today, you will be able to retire after this exact time. Our calculator will also provide you with a graph that depicts the balance of your savings account year ofter year. Did you notice how fast does the part attributed to interest increase? This is your passive income. The earlier you begin saving, the higher this passive income will be! Let's analyze the following example: you earn $50,000 a year. You have recently evaluated your expenses to be equal to $40,000 a year. You also have a decent sum of $100,000 on your saving account. Our early retirement calculator shows that you will be able to retire in 28 years' time. What if this number does not satisfy you? You make a review of your budget and decide that you can cut your monthly expenses by a further $500 if you will change your habits - cook for yourself instead of eating out. This number translates to annual expenses lower by $6,000. With expenses equal to $34,000 a year, the time before your retirement shrinks to 20.5 years. This is a 7-year difference! Don't you think it is worth the time you spend learning how to cook? :) Of course, you can cut your expenses somewhere else, but the bottom line is that you should always try to make the difference between your income and expenses as large as possible. It will really pay off! Bogna Haponiuk and Mateusz Mucha. Early Retirement Calculator can be embedded on your website to enrich the content you wrote and make it easier for your visitors to understand your message.